My friend sent me a New Yorker cartoon by John Klossner that says, "I'm spending more time promoting myself than I am being myself". I have had a great month doing just that, but now it's time to get back into the studio. 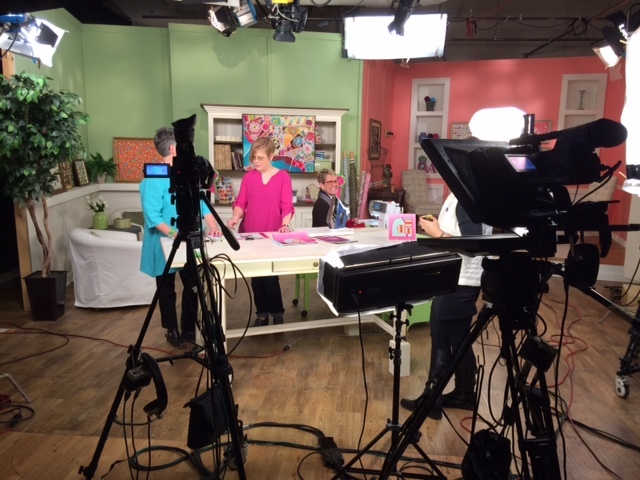 As many of you know, I went to Cleveland to shoot three segments for Quilting Arts TV, which is shown on many PBS stations. Despite being delayed two days by a blizzard I made it there and did not die from nerves. Susan Brusker Knapp is a delightful host and she and everyone there made the filming process as easy as it could be. Two segments will air during the next season of QATV and the third will air during the following season. I don't know if I can watch myself, but I'll let you all know when it's on so that you can watch it! I was also on the Crafty Planner podcast. Sandi Hazlewood is an excellent interviewer. We talked about art vs. craft, derivative art, and where modern quilting fits in the continuum of the history of quilting. And just in case you cannot get enough, the April/May issue of Quilting Arts Magazine also features a Q&A with me. This past weekend, while at MQX (Machine Quilters Exposition), I purchased 26 antique blocks for $13. The fabrics are full of awesome 1950s prints. I washed the blocks in the bathtub using Retro Clean, which is my go-to cleaning product on old fabrics. After washing and rinsing, I laid the blocks out on towels to dry, then ironed them flat. The blocks were not quite square, so I trimmed them all to 10.25" and pieced them together. Now I almost have a new quilt finished which will adorn our couch this summer.